Summary: NEW SCAM ALERT!! Recently we have been receiving multiple calls per day from people that have been approached by a company claiming to be “TIMESHARE CLOSING AND TRANSFER GROUP”. Please note we are not that company and in my opinion they are not a legitimate closing company. From the conversations I have had with the people that have called, be warned that in my opinion it is the most recent version of the SCAM that I have posted warnings about on this website for over 4 years. Please note if you are selling a timeshare for any value and are to receive proceeds from the sale that would exceed the money they are asking you to pay, then your costs would be deducted from the gross price and you would get an net amount. You would not pay money and get reimbursed after the sale in that case. The phone scam isn’t new, but the callers using a name similar to this company has increased recently. 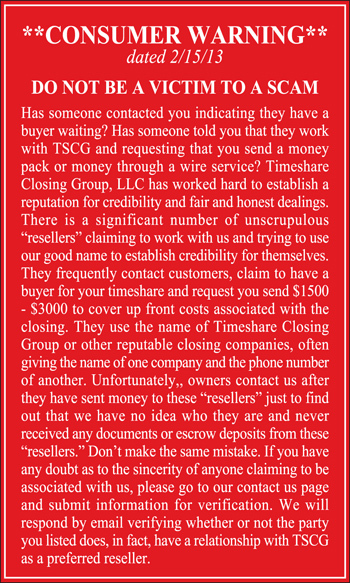 Timeshare Closing Group attempting to get information on the “sale” have increased recently. Timeshare Closing Group is a title company that works in nearly all cases on referrals from reputable real estate brokers, listing services for rentals and resales. We don’t make cold calls or ask for large up-front payments from sellers as they receive proceeds on the back end of a sale, after fees, costs, and commissions are deducted from the sales price. If you think a purchase offer is “too good to be true,” it probably is. Always feel free to contact us directly with any questions or concerns. The Timeshare Closing Group is an organization designed to service the needs of customers in two specific areas of the secondary market. 1. Assisting timeshare owners with Timeshare Closings and Title Transfers from private sales (resales), gifts, and family transfers that do not involve a purchase from the resort sales center. 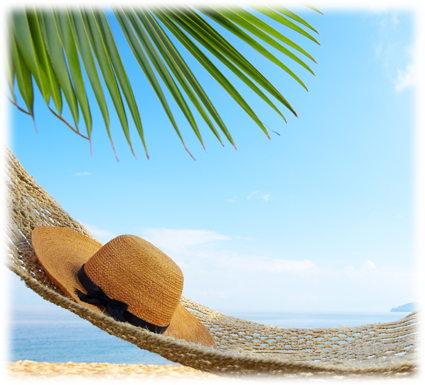 We have experience and the expertise to handle all of your timeshare needs. We customize our services to the customers problem, specializing in servicing clients in matters that are not covered by a resort tour or in speaking with the developer representatives. – Most customers purchase timeshare directly from a developer during the initial presentation at the resort sales center. The presentation is promised to last 90 minutes, but typically lasts much longer. – Most customers do not examine the purchase documents until returning home from vacation and usually allow the rescission period to expire before they read the paperwork. Often discovering a problem with the documents and the way the product was explained by the sales representative. – The number one reason customers purchase an additional timeshare is to solve a problem that was created on the first purchase. What customers should do is cancel the original purchase and renegotiating with the resort for a new purchase that matches what they were promised. But that very rarely happens. Think about that for a second. The very person who created the problem (be it usage rights, ownership unit size, or seasonality of the unit) is the person these customers place their faith in to solve the problem. Where else in your life does that happen? For me, if a car service center does a bad job, I have my car serviced elsewhere in the future. If I purchase something and the company does not stand behind the problem, I stop using that company. But in the timeshare world, customers routinely allow the very sales team that created the problem the opportunity to fix the problem, and the fix always, always, involves purchase of an additional unit week, or at the very least an upgrade to the “correct” unit you thought you purchased. The problem should be obvious, in these cases, the timeshare resort has another sale, and you have a larger mortgage payment for another 10 years. Problem solved right? But for who? If you are staring at your paperwork, pouring through details of an owner’s kit, and staring at the ceiling saying… If I knew this is what we were getting, I wouldn’t have done this. Well then the Timeshare Closing Group is a great place to begin to discover what you have actually purchased. The Timeshare Closing Group is not affiliated with a resort developer or sales center, but offers experienced individuals from within the industry, people who learned the business working for these developers before deciding there had to be a better way. Good customer service should be the lifeblood of any customer related business, but in the timeshare world, BAD customer service is actually accepted as a legitimate marketing target. Their idea is to take an unhappy customer and attempt to fix the problem while generating additional revenue for the company. What they should be focused on is making good on the original promise to the customer. The Timeshare Closing Group offers a variety of services designed to assist the customer, whether the customer is happy and just looking for objective advice to what they own and the realistic travel opportunities they can realize, or whether the customer feels they have been subject to misrepresentation, misunderstanding, or potentially fraudulent dealings. You will find the Timeshare Closing Group is the first stop you should make if you have questions about a timeshare purchase. The Timeshare Closing Group will take your call and the initial consultation is free. No obligation, just an honest assessment of your situation and suggestions for the future. Those calls result in an array of advice, from you have a great deal and you’re all set, to you’ve potentially been the victim of a fraud. We won’t know until we discover some essential elements about the sales process and the contracts signed. But you have our word that we are acting in your best interests when we make suggestions, taking appropriate action is your decision.